Are you looking for an easy way to organize and transport items in the trunk or cargo area of your vehicle? The CleverMade SnapBasket TrunkCaddy may be just the ticket! 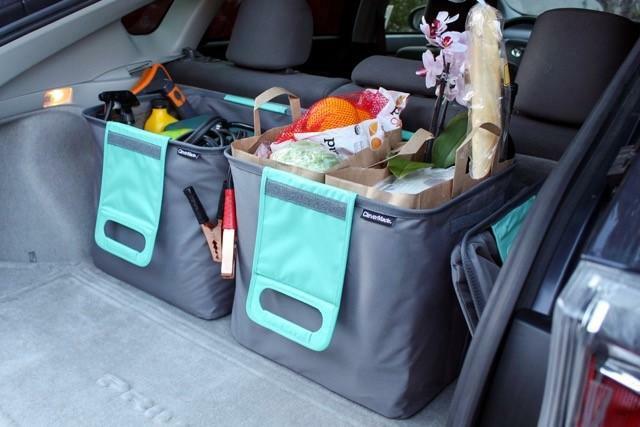 This easy-to-use storage item serves double duty as a car organizer and handy tote. Whether you're looking for an easy way to keep travel supplies organized in the car or need a simple way to transport food items to potluck dinners, you won't find a better option than the CleverMade SnapBasket TrunkCaddy. It's also a great solution for storing games or DVDs to keep kids occupied on the road, emergency supplies, sports or other recreational gear, groceries, and much more. The CleverMade team provided me with a pair of these containers to test for review purposes, and I love them. I definitely give this unique and practical product two thumbs-up! Available in a pack of two for $29.99, these containers have built in handles that make it easy for you to transition them from storage caddy mode to tote bag mode. You can easily keep multiple TrunkCaddy containers in your car to maximize your capacity for storing and toting items, as they are modular. Each caddy is outfitted with strips of Velcro that make it easy for you to connect the bags together, as well as to secure them to the carpet in your trunk or on the floor of your vehicle's cargo area. This provides stability when your vehicle is in motion as well as a simple way to separate the bags when you need to carry one (or more) into your home or other destination. Plus, these containers fold down to a basically flat size, so it's easy to tuck them away when you need to use your trunk or cargo space for other purposes. If you're tired of dealing with loose items shifting around in your trunk or the back of your SUV or hatchback vehicle, I highly recommend checking out this innovative storage product. You just may find that you need to keep several of these versatile containers in your vehicle to store and organize a wide variety of supplies and other items.